← Venous catheters and thrombosis, risk factors, consequences and treatment. You can’t diagnose reflux with a laryngoscope! I have seen in several places, and heard other neonatologists from elsewhere make snide comments about, a very high frequency of the diagnosis of serious reflux by ENT surgeons. Almost every time a consultation is requested, for almost any indication, the ENT team will make a diagnosis of reflux and recommend therapy. We often joke that a consultation that does not mention reflux would be worth publishing as a case report! This study is in children who were outpatients at Boston Children’s Hospital being evaluated for chronic cough with laryngoscopy, esophagoscopy/gastroscopy and esophageal impedance. (Rosen R, et al. The Edematous and Erythematous Airway Does Not Denote Pathologic Gastroesophageal Reflux. The Journal of pediatrics. 2016). 77 consecutive patients were enrolled, and 3 pediatric ENT surgeons of varying years of experience reviewed the videos of the laryngoscopy. 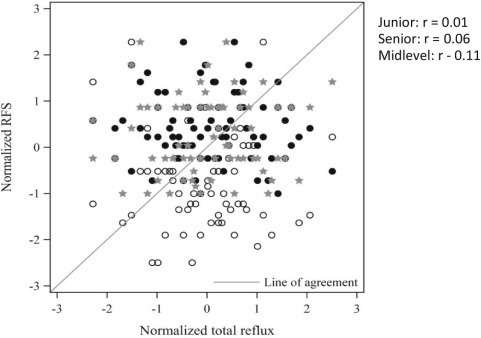 They used a “reflux findings score” which is repeatedly referred to in the article as being “validated” but I don’t have any idea what they mean by this, as they note that there is a great deal of inter-rater variability in the score when used in adults, and that it doesn’t relate to objective measures of reflux in adults either. So validated I guess just means that it is a score, “this score which I have created, which is mine— is mine”. The ENT surgeons in the study gave scores for each of the characteristics of redness oedema, presence of thick mucus and 5 other features. The children (average age about 6 years) then had combined pH with Multiple Intraluminal Impedance monitoring, the gold standard for detecting reflux, and for how high the reflux travels, if it gets anywhere near the larynx. You can probably guess the results, but one image speaks a thousand words (which won’t stop me typing the words as well). Absolutely no correlation between the scores, the RFS, and any measure of reflux that they examined. Also there was almost no agreement between ENT surgeons. They tried really hard, by creating new pediatric subscores of the RFS, and still couldn’t find anything. No correlation between the entire score or any subset of the score and number of reflux events, percentage of time with reflux, acid reflux alone or anything. In fact, with all the correlations that they looked at they risked finding something by chance alone, but they didn’t. They also looked at the correlation between oesophageal inflammation on biopsy and the RFS and again found nothing. There are 2 previous studies which have basically said the same thing, but this one had the best methodology. Next time you ENT surgeon tells you a baby has reflux, just gently and politely tell them that you can’t diagnose reflux with a laryngoscope, either in children or in adults. This article does have some other information that was new to me. ENT surgeons in the USA are among the biggest prescribers of Proton Pump Inhibitors in children, and the total cost of diagnosing and treating reflux in adults alone in the USA is 50 billion dollars a year. Equivalent to the costs of cancer. The children in this study did have a reasonable indication for the investigations, but the only way to tell if a child, or a baby, has more than average reflux is with prolonged ph-MII recording. But of course, even that doesn’t tell you if the reflux is pathological, just how much of it there is. This entry was posted in Neonatal Research and tagged Gastro-oesophageal reflux. Bookmark the permalink.